The foundation of a sound and safe auto body repair is a proper diagnosis of the damage to your vehicle and its frame. TAcentralautos (tacentralautos.co.uk) can provide fast, accurate repair estimates on any vehicle brought to our facility. Our estimate are not only FREE but comprehensive, detailed, and specific to the year and make of your vehicle. Bottom line, if your estimate is incomplete or performed without knowledge of how the damage affects related systems in your car you can end up with delays like waiting on parts or mechanical repair complications. Being in an accident is stressful enough. And when you are filling an insurance claim, the last thing you won't is less complication.TAcentralautos Can help you with the entire insurance claim process and get your car back on the road. Our work is 100% satisfaction guaranteed at competitive prices. 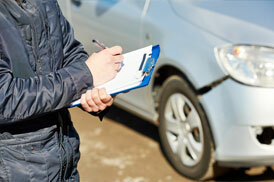 Limited lifetime guarantee on collision repairers.